Founded in 1899 by William Wood of Lawrence, Mass. and Charles Fletcher of Providence, R.I., The American Woolen Co. moved its New York headquarters into this building in 1912. This is a side (freight) entrance to the building at 221-227 Fourth Ave. (known as Park Ave. South since the early 1960s). American Woolen was a huge textile conglomerate with numerous holdings in New England woolen mills. This advertisement (signed by Wm. M. Wood, President) for the American Woolen Company appeared in Fairchild's Daily News Record and Women's Wear National Directory, Vol. 17, 1920. A similar ad appeared a year earlier, 1919, in the American Wool and Cotton Reporter, March 1919. This one gives their New York address on 4th Ave. The American Woolen Building is a 19-story high-rise building, designed by the architect, Robert Henderson Robertson (1849-1919), and built in 1909. (See skyscrapers.com.) Some of Robertson's other buildings are the Park Place Tower (1895) at 150 Nassau St. and the Park Row Building (1899) at 15 Park Row near City Hall. Another Robertson building with a sign featured on 14to42.net is the New York Savings Bank at 8th Ave. & 14th St. This sign is likely to date from the building's construction in 1909. The front of the building features a carved sheep's head (click for image). 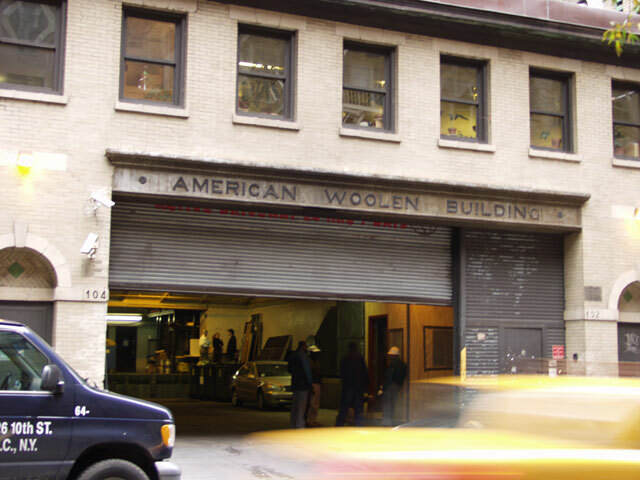 The American Woolen Co. was absorbed by Amerstron Corp. in the mid-1950s and vacated this building around that time.